Curious about how different prepaid carriers coverage compares? 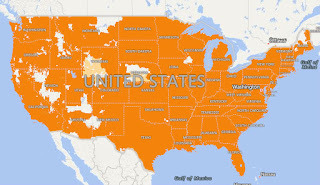 Here are the official coverage maps for all the nationwide prepaid mobile operators in the US. Click a map to go the original on the operators site. While comparing nation coverage is interesting and maybe even useful what really matters is if there is coverage where you live, work, party and vacation. All the carriers have detailed block level coverage maps on their sites. Last updated 5/24/2018: Fixed broken links. New map thumbnails for T-Mobile and Boost. Be careful with Cricket, they have, by far, the strictest, roaming rules of all carries. You go over 50% of your usage outside your home area,even once, and you are immediately cancelled, no warning! !on the other side of the spectrum is T-Mobile, they don't care at all, you can roam all you want. All others are somewhere in between. Best Prepaid MVNO is dependent on what you use the phone mainly for and where you need the coverage. CDMA: PagePlus = Verizon prepaid coverage + calls while roaming at .29/minute. GSM: H2O, Airvoice, Jolt = AT&T prepaid network. For coverage, Tmobile may be a better option for most people than AT&T MVNOs. You get free roaming on AT&T, and avoid the dropped call problem that AT&T still has in many areas. The AT&T roaming isn't all its cracked up to be. If you are roaming, you will be on 2G EDGE (except for select areas that allow throttled 3G roaming). MVNOs on AT&T may get lower network priority/speeds but you will get better coverage considering AT&T is now putting more attention on its 3G and 4G LTE networks. I just ordered a StraightTalk Galaxy Proclaim from a Verizon-only ZIP code (it wasn't offered in my ZIP code, even though Verizon is supposed to have the best coverage here (Denver). If Verizon is so widespread, why is the coverage so sparse on the map for StraightTalk CDMV-Android map? I've been trying desperately for about 10 days to figure out how to get a smartphone on the Verizon network at a price I can afford (retiree, not very tech-smart). Did I just order something that isn't going to work, or isn't going to give me the widespread Verizon coverage indicated on their non-Android map? You should not have any trouble activating the Proclaim in Denver. It will work everywhere that Verizon operates their own network (see the Straight Talk CDMA-V map above or the Verizon prepaid map minus the blue prepaid roaming areas). Straight Talk tries to minimize the availability of Verizon based phones, presumably because Verizon charges them more than the other carriers. You don't have to give them the zip code of where you live. Give them any zip or area code you want. I live in NE., but have a Honolulu, HI. area code. I did that just to mess with peoples caller I.D.s. If they don't offer it in your zip code why would you continue to try to buy it? That should have told you there was going to be a coverage problem.. Have you tried the phone in other locations in town? Perhaps you are having problems due to the mtns..
Be careful assuming tmo phones roam on ATT. I had a tmo postpaid phone and had no coverage in a rural area in VA. I had a prepaid art phone which had solid signal in the same area. The tmo phone did not switch to ATT. T-Mobile prepaid phones roam on regional operators or AT&T in some areas. There has to be a roaming agreement in place for roaming to be possible. The T-Mobile maps show where roaming is available and where it's not. there is only one straight talk smart phone that works on Verizon network.. Samsung Proclaim.. Check out straight talk website and look for the one that works on America's largest network.. The LG Optimus Zip and Samsung Showcase are also on Verizon. They aren't on the Straight talk site but can be found in some Walmarts. The LG Optimus Zip is available in zip code 75205 and others. You order it using that zip code and activate it in your home area. Samsung Centura works on Verizon. Some phone offer both CDMA versions and GSM versions, depending on where its sold. I ported my Verizon Droid Ultra over to ST. Works pretty well too. I pay less and get more data now with ST than I ever did with Verizon and I am still on their network. Are the above Tracfone/Net10 GSM maps still current? I notice this article is kind of old and the link doesn't go to their website anymore. They only have the CDMA map on their website, yet they sell GSM phones. Tracfone's coverage maps have always been pretty worthless because it's not possible to zoom in to see any level of detail. But I haven't heard of any changes to Tracfone coverage and the GSM map here is the same as the one on the Tracfone site. For CDMA Tracfone and Net10 PAYGO you can use the Verizon map as Tracfone appears to roam everywhere Verizon does. Net10 Unlimited Android coverage is the same as Straight Talk and is considerably less than Tracfone especially with CDMA. i have a tmobile contract expiring soon and have been looking at pre-paid options available . my service area is houston,tx. i like my tmobile galaxy s phone and have unlock codes for it. i am looking for a monthly unlimited plan, i dont use much data( checking e mails, looking at a website during lunch, and sometimes gps navigation when walks, biking, driving ). i was looking at net10/ simple mobile/ but thier customer service reveiws seem poor any suggestions? Depending on how many minutes and texts you need look at T-Mobile's $30 1500 minutes or texts, 30 MB plan, GoSmart's $35 unlimited, Ptel's $5/month and up pay as you go or Ptel's $40 unlimited plan. All of these use the T-Mobile network. See T-Mobile and T-Mobile MVNOs Compared for details of thes plans. As your phone is unlocked you could also use an AT&T based plan but it would be more expensive at most usage levels and you wouldn't get high speed data as your T-Mobile Galaxy S 4G doesn't support AT&T's 3G bands. I live in Southern California and have used Page Plus Cellular for years. They operate off of the Verizon Network. I have traveled to many places in the U.S. and have never had a problem using my phone (Casio GZOne Commando C771). They also have a lot of different rate plans that pretty much covers any budget situation. Plus if you already have a Verizon Wireless phone, your all set......just activate it, pick a plan, pay for it and go! A phone labeled CDMA-S will use the Sprint network only, never Verizon. Is the LG 840 tracfone. Any good ? What so they mean by 1400 minutes triple for life ? It means everytime you buy minutes, they will make it triple what you buy. In other words, you but 1000 minutes, it will actually be 3000 minutes added. Read fine print. May be restrictions as to the minimum minutes to buy, ect. The LG 840 is sold by Tracfone, NET10 and Straight Talk. It's a touchscreen only phone. The screen is pretty good quality. It's responsive, bright and reasonably sharp. Most users like the phone but some complain that the phone's reception in weak signal areas isn't very good. The Tracfone LG 840 is a triple minutes for life phone. That means that when you add refills the minutes are tripled. So a $20 - 60 minute refill gives you 180 minutes. Normally when you buy a Tracfone it doesn't come with any minutes. But HSN and some online dealers sell the phone with 1400 minutes good for a year included. Our experience with the Tracfone LG 840G is that the reception is pretty poor in marginal areas where our old Motorola flip phone worked fine. Phone is homed on AT&T. We also have problems with handling the touch screen often rejecting calls we would like to accept. We just ordered a LG 250C using a Verizon only ZIP Code giving up the triple minutes and easy texting feature for a simpler phone with hopefully better coverage. I don't know how I managed to stumble onto this website, but it's an amazing resource. Thank you for managing this service! I am considering a LG505C tracfone from amazon with triple minutes. I live in NH but will be traveling to SD/Wyo soon. I googled and found out that this phone is a CDMA. There is no place in the check-out process to enter a Verizon zipcode. How do I ensure the phone is set to Verizon coverage in this situation? You've helped me enormously and it's a relief. Thanks so much. So thankful to find a helpful website full of great information. I'm looking to purchase an iphone with a pre-paid contract. I'm currently with Virgin Mobile but have terrible data service with it but I am using an android phone. Would purchasing the iphone help my service with Virgin Mobile or would you recommend switching to a different carrier? If data speed or reliability is a problem with an Android phone it will likely be a problem with an iPhone as well. Data issues are usually network issues. I recommend trying a service that doesn't use the Sprint network. Ask friends and family what works for them and choose a provider that uses a network that others find works well in your location. would straight talk or virgin mobile be the best plan with an iphone 4 or 5 in Colorado springs, co.? I need more info on virgin mobile I am considering one of the two plans. Only you can decide which is best. If you need less than 1200 minutes a month and Sprint coverage works for you Virgin Mobile would be less expensive. Data works well on iPhone 4s in my area. This is a great resource! We've been considering moving from US Cellular to a Straight Talk smart phone primarily due to local coverage issues. However, we typically spend 6 months in NC and 6 months in FL - Will this create administrative or roaming issues with Straight Talk? Also, we would appreciate suggestions for an affordable smart phone from Straight Talk. Thanks! Straight Talk provides nationwide service. There shouldn't be any issue with using the phone 6 months in NC and 6 moths in FL. T-Mobile: Straight Talk sells T-Mobile SIMs, not smartphones. Use the SIM with any T-Mobile phone. The Nokia Lumia 521 $150 and LG L9 $200 are good choices. Straight talk has NO roaming charges anywhere in the U.S. One bad thing about S.T. is that even if you buy the international card, it will only make calls ORIGINATING in U.S. or Purto Rico. Then it will call most international destinations as long as you have a access calling code. In other words, when we went on a Disney Cruise, Straight Talk would not work while out to sea.Even thought the ship has signal for most major carriers via satelite, the actual tower that the sat. signal comes from will be closes country to which a tower is availible. To put it simple, if the call does not originate on a U.S. or Purto Rico based tower, straight talk will not be able to call out. It will not have a signal. Hey.. Great site! If anyone has an answer I would greatly appreciate it... I live in upstate NY (12771) and want to get rid of Verizon. Is Straight Talk my best choice? 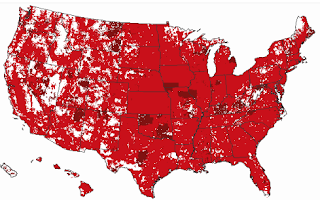 Verizon does have the best coverage in my area and I would prefer to use their towers. Thanx again!!! A Straight Talk phone that uses the Verizon network would get the same coverage in 12771 as a Verizon phone. See How to Tell Which Network (AT&T, T-Mobile, Sprint or Verizon) a TracFone, NET10 or Straight Talk Phone Uses. check if AT&T have a good coverage and choose straight talk using the ATT sim card because the box comes with 2 sims, one fot ATT and one for T mobile.If Tmobile the best coverage,choose the Tmobile sim card. Thank you and good luck. You might want to delete your comment and repost it without including your email address. This is a public web page that every spam bot in the world can see and scrape. Click the "subscribe by email" link to securely sign up to receive replies. 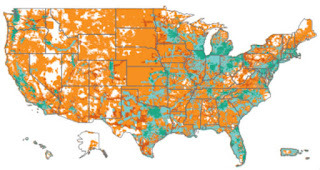 Generally speaking AT&T and Verizon have the best overall coverage. Use the links to coverage maps on this page to research which will work the best for you. Your Verizon S III won't work on an AT&T based service and would need to be flashed to work on a Verizon based one. My experience living in the Western States is that Verizon coverage is unbeatable, Never let me down. If you click on the maps, it will take you to the operator's site where you can enter your address for a detailed map. I'm guessing that 40 mi ESE of Lewiston would be near Winchester, Idaho. 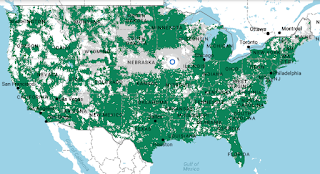 Looking at the AT&T, Verizon, T-Mobile and Boost (for Sprint) maps it appears like AT&T is the only one that might possibly cover your area. AT&T coverage ends just NW of Winchester however. If you have any neighbors, what do they use? Local expertise trumps computer generated maps every time. There's a local cellular operator, Inland Cellular that covers the area around Winchester. They don't seem to offer prepaid however. I believe that Verizon roams on Inland which is why you can text, You should also be able to call for 29¢/minute on Verizon while roaming. I live in Pullman and hunt/fish throughout your area. ATT, Verizon and Inland Cellular are the only providers that work in your area. Verizon uses Inland Cellular as a partner in that area , so they may not work either. They do have competitive prepaid plans though. Try ATT first and Inland Cellular next. You likely won't get much better coverage though since they tend to share a lot of the same towers. The new, purple and pink Tmobile postpaid map is not accurate in some places. 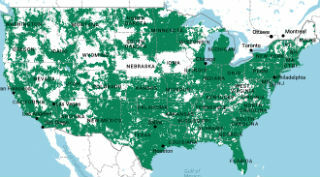 The old maps shown on this post and the latest, green Tmobile prepaid map are still accurate. That's the post-paid T-Mobile map. When you zoom in you can see that it's divided into pink (native T-Mobile) and purple (service partner, aka roaming) areas. Prepaid has less roaming than postpaid. Thanks, Dennis. I confused the purple (partner roaming) with dark pink (strong Tmobile) because the spots I checked have weak Tmobile prepaid map coverage, but partner coverage indicated on the postpaid map, something I did not expect to see. I thought Tmobile only used partner towers where they had no Tmobile towers, but that is apparently not true for postpaid accounts if the postpaid map is correct. These areas got a weak signal or no service on Ptel last week, but are shown as partner coverage (purple) on the postpaid map. I don't have a postpaid phone to verify the partner coverage in these spots. MetroPCS new coverage map is very interesting. It shows GSM coverage in lots of places where Tmobile and Metro have no network. Does this mean that they include roaming on AT&T? 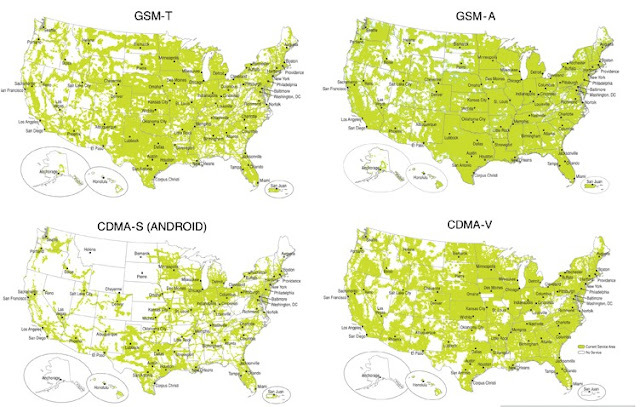 That's the old CDMA coverage map which includes free roaming on Cricket and Sprint and extra-cost roaming on Verizon. Aio's coverage map shows LTE in yellow so you can see where they and GoPhone provide the fastest speeds. Please consider including this map. The current GoPhone/MVNO map only shows "best coverage." Is that supposed to by LTE, or just HSPA+/strong signal? I can click on Data/LTE to see LTE on the GoPhone map, but their shades of orange make it much harder for me to see the boundaries than the yellow on the Aio map. Your MetroPCS coverage map link does not work for me any more. It brings up a blank map on the Metro site, and I have to click on the Coverage Map tab on the Metro home page to see their coverage. The map does take a while to load. http://www.metropcs.com/metro/maps/coverage-map.jsp and the map does load if I wait a while. It was not loading earlier for me. My link doesn't have a slash at the end. Firefox 23.0.1 and Safari Version 5.1.9 (6534.59.8), both Mac, show slash and get the error message. I only get the slash when I click on the map itself. Thanks, Dennis! The map click works now. Thanks for reporting the broken link and for all your help in tracking down the cause. 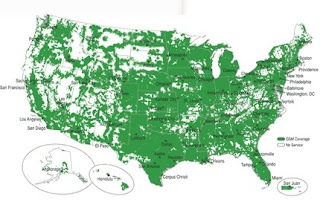 All the coverage maps have big holes with no signal, especially out West. I saw an article in the current Aug 19 Autoweek magazine on cycling overland. They recommended a sat comm device when you are venturing out into remote places - could save your life. For $170, the Spot Connect turns your smartphone into a sat comm device. $120 Spot's Sat GPS messenger provides essential comm functions and custom messaging. $100 buys you the Spot Personal Tracker that handles the basics. If you can afford the adventure, you can afford one of these. A lot of those blank areas are also devoid of roads, houses, or even trails. We have the same issues up in the Adirondacks in northern New York State. This summer I lost signal for a half hour driving on a major route through there. AT&T or Verizon are the only services worth bothering with. A few years ago you could drive an hour or more with no signal, but they are gradually filling in the holes along major roads. But, if you hike off into the woods you can easily lose all service, unless you climb a mountain. From the mountain tops you sometimes connect through towers in Vermont or Canada, which makes for confusing 911 calls at times. Can you confirm if Straight Talk phones will get LTE service when using Verizon's network? I'm considering an iPhone 5 (CDMA-V) for friends in an area that has LTE. LTE is crippled on that phone. LTE is not available with Straight Talk It's not available with any other Verizon MVMO or even Verizon prepaid. Found your site by googling "tracfone". Great info! Thank you! I have a Motorola W370, Tracfone, that needs re-activated. I want to use it to call my daughter in Coimbatore, India (CDMA network?). I know it works here and I think tracfone works there. My concern is: does tracfone, or this Motorola phone, have compatibility with "viber", which is a system already used by people in the household where she is staying. Any advice? I currently use Verizon, but am not happy ever since they assured me that her phone would work - does not. My intuition is to re-activate the Motorola, then change devices if I need to, in order to use "viber". Make sense? or, I select a replacement phone that works with "viber" and skip the tracfone...however tracfone will cost much less to use. You can't call from the US to India using Tracfone and Tracfone devices do not work outside the US. The free calling and messaging app Viber will not work on a basic phone like the Motorola W370. It requires a smartphone, either Android, iPhone, Windows Phone BlackBerry or Symbian. I've never been there. Ask locals which operators work for them or use the links to the post to each operator's coverage map. which prepaid plan works well in 80920 on a iphone 4 or5? No idea. Ask your neighbors what works for them and/or use the map links in the post to check coverage. Probably no other carrier will activate the phone. Sprint controls this. Sprint doesn't allow its MVNOs to activate Boost phones. It should be possible to flash a Boost S II to a Verizon MVNO like Page Plus or Selectel. Would be nice to see T-Mobile coverage map minus the 1700 band. If you mean a map showing T-Mobile 1900 MHz 3G coverage, that would be nice. There's no official map but has airportal.de a crowdsoucred map. I am a straight talk customer and would like to buy off ebay a unlocked verizon samsung galaxy 3. I currently have the samsung centura. My centura uses the verizon net work. Would an unlocked phone work on the straight talk plan using the same verizon towers I have now just by using walmarts sim card fir straight talk? That won't work. Straight Talk will not activate Verizon LTE phones like the Samsung Galaxy S III. So any samsung galaxy s 3 cell phone that is unlocked and for sale on ebay will not work on straight talk plan? Regaurdless if its a verizon phone? An AT&T S III will work with a Straight Talk AT&T SIM, a T-Mobile S III will work with Straight Talk T-Mobile SI. An unlocked GSM S III will work with either Straight Talk SIM. Straight Talk will not activate a Verizon S III on the Verizon network. There's a hack (see: http://forum.xda-developers.com/showthread.php?t=1809314 ) to enable GSM on the Verzion S III but it's not simple and you will only get 2G with a Straight Talk SIM. What phone will activate on straight talk? Can a sprint phone be flashed to work straight talk? Like a galaxy s3. Interesting. Ebay seller has samsung galaxy s3's that are sprint phones and says he can flash them to use verizon straight talk. Says create an account on straight talk then give him your account # and password so he can activate it . Basicly your phonne # and your pass word he activates it then ships gou your new phone. Straight Talk can reportedly detect that the MEID is cloned and will kick the phone off the network if they do. Cloning MEIDs is probably illegal. I would not give anyone my account number and password. True, I wouldn't do it. I'm buying a Samsung Galaxy S111 with Virgin Mobile service. If I don't like the service I get with them, can I switch to another carrier with the same phone? Not easily. CDMA phones aren't portable between operators. I've heard of people flashing Virgin phones to PagePlus but it's not for the faint of heart. I have a Motorola Defy Mini XT321 that I bought in Malaysia. It will work with WCDMA 850/2100 and GSM 850/900/1800/1900. Can I set this phone up on Straight Talk's AT&T network? If it's unlocked it would work but data speeds would be 2G in areas where AT&T uses 1900 Mhz only. Dennis, I was wondering if you can help me out... I currently have an LG Venice for Boost. I'm currently looking to try another service. I was thinking about straight talk. However, the kind of plan I'm looking for is an unlimited prepaid plan with more than 1G per month. Which prepaid service has the best coverage? I like to travel and would rather have that. I was also wondering if i got a GSM phone and use it for straight talk would it be good? Have you ever heard of H20? If so any concerns or comments on that provider? Thanks! No one operator has the best coverage. You need to do your own research using the map links in this post to find the ones with coverage in the places where you expect to use your phone. I don't recommend H2O as they throttle data speeds after 500 MB, have sub-par customer support and are no cheaper than Airvoice or Red Pocket. I didn't want to use my LG Venice.. It's too slow for me I was going to get an upgrade either the Iphone 5 or Galaxy S3 not the S4 because there aren't too many prepaid carriers that provide that phone. I was just wondering which carrier would cover the most areas. I just travel to FL and CA most of the time I live in Boston. Overall, Verizon and AT&T have the most coverage. However there are areas that neither covers but Sprint or T-Mobile does. I see.... Which carrier uses AT&T and or Verizon? Can I also use my own phone? With Verizon and Verizon MVNOs using your own phone is more limited. see The Best Smartphones For Page Plus, Selectel and Other Verizon MVNOs and Where to Find Them for a list and discussion. Okay I'm starting to understand this a little more... What does MVNO mean?? Mobile Virtual Network Operator - a mobile operator that doesn't operate its own network and resells service from one of the big four. Straight Talk, NET10, PagePlus, PTel, Red Pocket and Airvoice are a few of the larger MVNOs. I see like Boost is an MVNO because it uses Sprint right? I'm on the ATT wireless site now and I checked the $60 monthly unlimited w/data (Go phone prepaid) it doesn't have a large selection of phones.... Can I use my own phone?? Boost is not an MVNO because it's a brand of Sprint which is a network operator. You can use any AT&T phone with GoPhone or any unlocked GSM phone that supports the 800 and 1900 Mhz bands. Oh ok lol. What carrier do you use? What does PTEL run off of? I'm on the site and the deals look good. Straight Talk: same coverage as AT&T, best price, poor support, picture messaging isn't very reliable. What about Bright Spot from Target with TMobile? And hows Net 10? Brightspot coverage and speeds are identical to T-Mobile. LTE and off-network voice and text roaming is available unlike other T-Mobile MVNOs. I haven't heard anything about customer support quality yet. NET10 and Straight Talk are the same company including the same not very goo customer support and MMS issues. Okay so hmm my choices now are BrightSpot,ATT and Verizon prepaid.... Which would you choose lol does Verizon use unlocked GSM too? If T-Mobile coverage works for you go with Brightspot or MetroPCS GSM which has the same T-Mobile coverage and support for LTE but gives you 2.5GB unthrottled for $50 instead of Brightspots's 1GB. If you T-Mobile doesn't cover the areas you plan to use the phone and AT&T does, go with AT&T. OH YEAH! I just found out that Metro and Tmobile are joined together now is that true? I also was thinking about the 4G data with brightspot... Ok Verizon is off my list. I don't understand why TracFone ask the Zip code to find a phone. What does that mean, is that we cannot use the phone our side of the zip code or do we have to pay the roaming fee out side of the zip code. If that is the case, how much they charge as roaming fee for the usage out of zip code or out of state. Can someone please answer these questions. 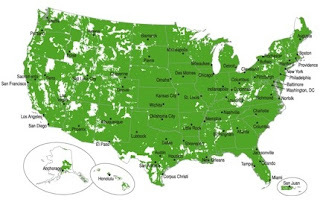 TracFone asks for your zip code so it can limit your phone selection to models that use a network operator (AT&T, Verizon or T-Mobile) that has service in your area and is most cost effective for TracFone. You can use the phones anywhere in the country that the operator associated with the phone has coverage at no extra charge. TracFone's non-Android phones also have no extra cost roaming on other partner networks. Will the straight talk towers (that use Verizon) give as good of signal as a direct Verizon Phone Plan? Hello! I am moving to zip code 59801 and I am currently with Net 10. I want to do a BYOD and need to purchase a new phone. Could you please point me in the direction of carrier I should lean towards (AT&T Verizon etc) and is there a differance between Net 10, Strait Talk or TracFone? Thank you so much! I have never been in zip 59801 so I have no personal experience with any operator's coverage there. Follow the links on this page to each operator's detailed maps and check which ones cover that zip. Better yet ask people who live or work there which operators works for them. Thanks for your valuable article and great responses. Would you offer advice for the zip code 47906 which is home area for Purdue Univ. I just have general usage for voice, text and data, not a lot of each of them. I don't have any personal experience with coverage in zip code 47906. As always the best source of coverage information is asking locals which operators work for them combined with checking each operator's coverage map using the links in the post above. I have a Boost S2. I went to the net10 site and it says that my phone is compatible. It also says..... Good news, your phone is compatible to use on NET10. If I purchase a activation kit it doesn't guarantee activation...right? What are your thoughts on this? Sprint doesn't allow it's MVNOs to activate Boost phones. I'd be very surprised if you are able to activate a Roost S2 on NET 10. Hello. I want to buy a Galaxy s3. I have been looking on Craigslist and have found a few but do not know what prepaid service has the best coverage for my area. I live in Columbus,OH. We do have unlocking services here but I do not know the difference between GSM and CDMA and all the sub types. I do not want to buy a phone from someone I cannot use. Thank you for your time. I have no personal experience with coverage in Columbus OH. Use the links to all the carrier's coverage maps on this page to see which ones will work for you. Even better, ask friends, neighbors and family members about the carriers they use or have used in your area. CDMA and GSM are two incompatible network technologies. AT&T and T-Mobile use GSM. Verizon and Sprint use CDMA. Phones that were reported lost or stolen or where the previous owner has a past due bill will be blacklisted and can't be activated on any carrier. Unlocked AT&T and T-Mobile phones will work on either carrier but may not get 3G data. CDMA phones are difficult to move between carriers. They need to be "Flashed" which is expensive, easily broken and not possible with some phone models. In addition CDMA carriers can block arbitrary devices for commercial reasons. Sprint doesn't allow phones released in the last 12 months to be activated on its MVNOs. LTE phones are blocked on Verizon prepaid and require flashing to work on Verizon MVNOs. I deleted your first comment which included your email address. Posting your email in an online forum like this will result in you getting tons of SPAM. To get replies emailed to you, create a new comment on this post and check the "Notify me" box below the comment form. How does the new Nexus 5 figure into the Straight Talk plan. I need coverage in two different locations - Phoenix and zip code 85933. The only coverage in 85933 is from Verizon (which is OK). My main use is in 85224. Is there any way I can get a Nexus 5 and set it up for Verizon coverage in both locations? A Nexus 5 will not work on Straight Talk as CDMA (Verizon) phone. It will only work with a Straight Talk SIM (AT&T or T-Mobile). I suspect that someone will soon figure out how to flash the N5 to Verizon Page Plus or Selectel which are Verizon MVNOs. I think BrightSpot from Target also has free voice and text roaming on Tmobile. Since Ting, a Sprint MVNO, provides roaming on Verizon without charges, does it mean Ting's voice coverage is the combination of Sprint and Verizon? In another words, Ting's coverage is larger than Spring or Verizon? Ting's roaming is determined by Sprint's roaming agreements which include roaming on various operators in specific locations. Sprint does not have a blanket agreement to roam on Verizon's entire network. In some locations where Verizon has service Sprint may roam on a different operator or not at all. Ting's voice coverage is the same as Sprint postpaid. I doubt that it's larger than Verizon postpaid. Is Verizon prepaid coverage (3G) same as Verizon postpaid (4G) or smaller? It is hard to tell accurately from the maps. Thanks Dennis for yesterday's reply. The coverage is the same except that you pay 20¢/minute for roaming on prepaid and roaming is free on postpaid. I live in Portland Oregon and am thinking of buying the Google Nexus 5 unlocked. I want voice text and data with best coverage optoin. Suggestions. I am trying to figure out what would be the best pre-paid service plans. I live in Superior Wisconsin. I was thinking going t-mobile pre-paid or straight talk. Which would be your best option for coverage wise. I also can only afford so much as well, I would like a unlimited everything plan as well. I have a HTC Incredible and a Galaxy Nexus that were both on Verizon's network and both contracts are up. What are my choices for these phones as far as prepaid networks? can I get them to work on Straight Talk? The Incredible will work on StraighTalk, the Nexus won't because it's an LTE phone. It could be flashed to work on Selectel, BYO or PagePlus. You can buy Verizon prepaid phones without Verizon service on Amazon and at Radio Shack, Best Buy and Target. Among the current Verizon prepaid phones, I recommend the Motorola Moto G.
You won't find one with a SIM card however. Except for LTE phones and global phones Verizon phones don't use SIM cards. Verizon doesn't allow LTE phones on prepaid and has never sold a prepaid global phone. If you know you want a phone on the Verizon network what difference does your zip code make? Dennis, great forum. I have a Droid Razr, XT912, I would like to use in Verizon network with either Net10 or StraightTalk. I read your posted links to stuff and I am still unsettled on what to do. I was hoping to use the Samsung Galaxy SIII, but that phone looks like it won't work now. What other similar phones would work with Verizon? Straight Talk and NET10 both sell a version of the S III that runs on the Verizon network. See Straight Talk and NET10 Verizon Galaxy S III Now Available Minus LTE. No other phone they sell is at all similar to a SIII. Great blog Dennis. Can you recommend a phone similar to Samsung Galaxy SIII for use on Verizon network through either Net10 or StraightTalk? hi, I have purchased MOTO G verzion mobile on last month through amazon, after receive this device only i came to know this is CDMA network. Now am unable to activate this phone. Can you someone can help me which carrier will able to activate VERZION mobile in inida. I don't think it's possible to use the Verizon Moto G in India as it only supports the US frequency bands 850 and 1900 Mhz, not the 900 and 1800 Mhz bands use in India. Hi Dennis, Some one have intimate that MOTO G will work with reliance CDMA network, let me know if this possible or fake msg. How will know my MOTO G is locked or unlocked, kindly advice me. SIM locking only apples to GSM phones. Well noted with many thanks, will return this mobile phone to USA. Tmo has made a lot of progress refarming its 2G EDGE coverage to 4G. Here are some of the places where this has happened. I saw those maps. They show how little the merger will do to improve T-Mobile or Sprint's coverage. I believe that instead of merging, both carriers should be buying up regional and rural operators with the same (GSM for T-Mobile or CDMA for Sprint) technology like U.S. Cellular, Cellcom and nTelos for Sprint and Alaska Wireless, Plateau Wireless, IMMIX and Viaero for T-Mobile. That would expand their coverage in addition to gaining customers. Safelink looks like the better choice in your location. According to the Boost Mobile map Sprint coverage is spotty around zipcode 06751 so I would avoid Assurance. Safelink will use either Verizon ("C" suffix models) or AT&T ("G" suffix phone models). Both appear to have good coverage in and around 06751. Is there a prepaid carrier that is best to use for only occasional data? I'd like to access mobile Internet outside the home but would not be needing tons of data or super fast connections. I am considering Page Plus or Republic Wireless but don't want to pay for what I don't need. Also, does either plan have an overall better data coverage? That depends on how much data you will use and how much voice and text usage you have and what networks will work where you will be using the phone. For under 300 total minutes + text + MB of data per month a pay as you go plan will be least expensive. Any more than that and an unlimited talk and text plan with 500MB or more of includes data will be more cost effective. You need to run the numbers based on your needs and usage. See The Best US Prepaid Plans For Voice and Data Users for my recomendations of the best choice on each network for various usage levels. Who has the Best Prepaid Coverage? Verizon and any Verizon MVNO like PagePlus or Tracfone, Net10 and Straight Talk phones that have the code CDMA-V on the box. Phones with any other code don't run on Verizon. AT&T and their MVNOs like Cricket also have great coverage. Tracfone CDMA and GSM feature phones do roam. Tracfone smartphones don't. All Straight Talk CDMA phones don't roam. All Straight Talk GSM phones do roam. If you roam very much (more than about 25-50% of the tine) TracFone/Straight talk will permanently disable roaming on you account without warning. Update: Verizon bought Golden Gate Cellular in April. I expect that they will soon make its towers part of the Verizon network abd you won't need to worry about roaming anymore. Does anyone know why my samsung centura has a strong signal in Idaho and is poor in Ogden, Utah. Keep in mind I got this from my son who originally bought/used this in Idaho. Coverage varies. It has nothing to do with where the phone was activated. 1. In an area where you have a signal signal, on the main screen, tap the "Phone icon." 2. Enter "*22890," then tap the "Phone" icon. 3. Your phone profile and PRL will be updated. When finished, a "Phone is activated!" message will appear at the top of your screen. Tap "Next." Your phone will restart. If you continue having coverage problems at your current location changing phones or providers is the only solution. The zip code you give TracFone when ordering a phone determines which network's phones (AT&T, T-Mobile or Verizon) they will sell you. The zipcode you give them when activating a phone determines which area code you will get a number in. It has no effect on coverage. See How to Tell Which Network (AT&T, T-Mobile, Sprint or Verizon) a TracFone, NET10 or Straight Talk Phone Uses for more information. The subscribe by email link is on the "Subscribe" tab of the right sidebar on the desktop version of the site. To activate your new phone and keep your old number choose the "Transfer my number and service from one TracFone to another." on the TracFone online activation page. When you do that it doesn't ask for a zipcode as it isn't assigning a new number. If you want to post using your name instead of anonymous, choose the name/url option. It doesn't ask for your email address. The url is field is optional, you can put your personal blog, Face book profile or Tumblr, etc. in that field if you want to. Dennis, Does it make a difference in zip code you use and coverage ? When I had my Washington number and the phone started acting up....no bars. When I called tracfone they told me I needed a new number. I said it worked fine for four years why now do I need a new number? There answers are all scripted .Do I need a local number to get the best reception? This in response to the question above? myabe you can help me understand something. We have been with tracfone for years and just recently ordered 3 new phones(myself,hubbyand daughter) now tracfone wont activate them because they say there is no technology in our area for these phones. The samsung galaxy centura. It is a cdma phone correct? we are in NC, which is completely shaded on the cdma map and almost completely on the gsm. They wont transfer number and min to the android phone and number can't be transferred to a new zip. I have checked zips all around me and it says it will work in almost all of them. Some are less than 10 min from me and a couple of them won't even give me a signal now with my GSM phone. I am considering activating with a new number but I have to buy a min card to do that and don't want to waste more money since we are 180 bucks in on the 3 new phones that we are stuck with because of store policy and we ordered them a mnth before Christmas. If doing the transfers online won't work and you have to call you may have to call multiple times and/or ask for a supervisor to find a rep who is able to make the transfer. If there is no Verizon service at the location of your current number you will have to accept a new number and your phones will not work at that location however you should not lose the balance and minutes on your account. Assigning a new number to a current account is a pretty common practice and it should not be too hard to find a rep to do it. I ordered a phone for my birthday and its a tracfone, I checked to see if it worked here before I bought it and it was supposed to but when we tried to activate it, it said that they don't offer coverage here. I was wondering if you can use a different zip code than where you live and it still work where you live? TracFone non-smartphones have voice and text roaming so if you can get it activated in a different location there's an excellent chance that voice and text, but not data and MMS, will work in a location without native coverage. TracFone Android phones don't roam. I live in Wisconsin my zip code is 53590. I am looking for a prepaid phone to cut back on costs. What is the best prepaid company for unlimited text, data and voice. I believe that 53590 is covered by all four national networks but don't take my word for it use coverage map links in the post to verify coverage. As for what's best that depends on how much and where you travel and how much data you really need. The only truly unlimited data plans are from MetroPCS and T-Mobile at $60 and $80 per month respectively. Unless you watch a lot of video on your phone or stream music all day long you can probably can probably get by on 1-2 GB of data per month at a lower price with better coverage from an AT&T based operator like Cricket. See The Best US Prepaid Phone Plans For Data Users for a summary of what's available. Interesting article about how Sprint and T-Mobile both reached 280 Million POPs coverage with their LTE networks; Verizon and AT&T now cover 308 Million each. Updates on 2015 network expansion status, and new retail stores planned to match the increase. The phone should switch to the strongest tower as you travel around. It it seems stock on a week one turning airplane mode on and off will make it search for the strongest one. Trucking OTR. The best voice coverage i found is us cellular. Tracfone cdma dumb phones roam well too. I'm looking for the best prepaid hotspot plan for Ohio & surrounding states. Any suggestions? I am leaving a family plan with T mobile and getting a single plan. Who has the best coverage in Colorado Springs? I haven't been to Colorado Springs in over 20 years. It's a good sized city so I imagine all four carriers will give at least decent service in the city proper. Check the maps to compare coverage in surrounding areas which are very rugged and were quite sparsely populated when I was there. I am going to be in bermuda, st kits, San Juan Puerto rico, st thomas and would like to keep communications with my family. What pre paid could I get that won't kill me with roaming fees? I am with straight talk now and have gotten excellent service here in the states, but straight talk said they don't provideservice coming into thestates,,, any advice?. I live in Maine but plan to travel to Alaska thru Canada; what is the best prepaid phone for coverage for traveling, especially to these areas? You're going to want to go with something that uses ATT towers, like Cricket or StraightTalk. I've heard nothing except ATT and one small carrier exclusive to Alaska gets service up there. To follow up on "Unknown's" comment: Cricket uses AT&T towers in the U.S. , and roams for voice and text (no data) on the Roger's network in Canada. You would have to have an unlocked (or AT&T locked) GSM phone to sign up for Cricket service, and would need to get either the $50/mo. "Smart" plan, or the $60/mo "Pro" plan to roam in Canada. If you needed GPS on your phone, I suggest that you sign up for the free Nokia "HERE" GPS App, and download the appropriate state and provincial maps for your route. This program is free, is "Maps On Board", meaning that it does not require data, just a GPS signal, and works great. Cricket's coverage in Canada uses the Rogers Network, and does not include the Yukon Territory, meaning that you will not be able to call 867 area code #'s, but may be able to call from YT to other area codes in Canada and the US -- I'm not sure. Here in Alaska Cricket works great, since it uses the AT&T network, which in my experience has by far the best coverage. If you do go with Cricket, I would sure love a report on service (if any) in YT. Thanks so much for the help.....will report back regarding YT service (not going til next Spring though).